Another round is done. Got home Friday. It's half time - 3 rounds down, 3 more to go. This round was tougher. I'm sleeping a lot more which I don't really mind because it's a good way to pass the time in the hospital. What's annoying is that Stanford hospital changed their policy, and family members are no longer allowed to stay overnight in the rooms. It's not fun being at the hospital alone at night. I don't really need someone there, but it feels better when someone is there. The results from the CT I had 3 weeks ago were good. The doctor was very happy. She said the tumor is stable, not growing, and even slightly smaller. She also showed me the scans. She showed me a part in the center of the tumor that is dark which, from what I understood, dead cells. So that's good news, the tumor is dying, and the chemo is working. 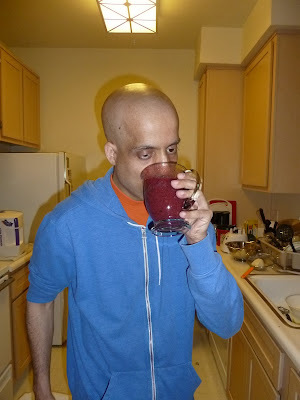 I'm more tired during the chemo, and don't feel like doing much. I have started reading some books. The harder part is the mental side, staying mentally strong. I keep thinking of how much more I have left till I can try getting back to 'normal' life. How much time till I can maybe go back to school, and get a job again. Right now there isn't much I can do. I cannot do any sports that I like because of the medical port. I'm stuck at home most of the day, and my days are pretty empty. I have quite a lot of material, and notes I wrote on paper. Usually what happens when I have too many ideas is that I get overwhelmed, and don't know where to begin. I think I will be able to organize all those thoughts this week, and maybe next week I'll have loads of posts. 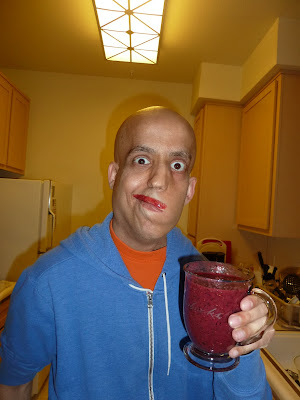 I've been drinking a lot of fruit shakes. It's not cheap, but I'm sure maybe body is pleased I'm drinking them than some sodas. Some things you should know, especially if we see each other often. Due to my surgeries I have a few limitations that are, perhaps, not so obvious. Limitations that I need my friends and people I hang out with to know, and do their best to remember. 1. I cannot talk loud. 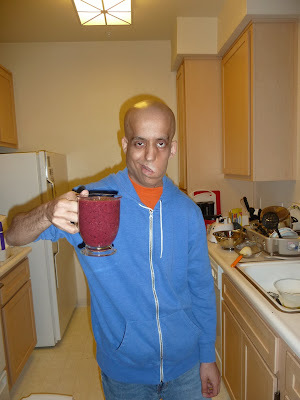 After my last major surgery which was in summer of 2007 my left vocal cord was paralyzed. At first my voice was completely hoarse. I waited about a month, and there was no change, so I went to see a doctor specializing in vocal cord. He injected a substance called collagen to my vocal cord box from the left. The collagen pushed the left vocal cord towards to right cord which made for a better contact. This substance dissolves after a few months, but in my case somehow after a few injections the left cord stabilized in the center. Still, in summer of 2009 I decided to have a surgery where the doctor implanted something small to keep the left vocal cord close to the right. So I'm able to talk and be heard, but not in every situation. If we are hanging out and the music is on loudly, either lower the volume a lot, or don't ask me any questions from the other side of the room. I prefer you show some understanding, and lower the volume so that I can make myself heard over the music. When the music is loud chances are that even if you're standing right next to me I won't be able to make myself heard. Packed bars on the weekends are a problem too. Yes it's hard for everyone to talk, but it's impossible for me, impossible. Packed loud restaurants are also an issue. If you're sitting next to me or across me it should be fine. Even a hangout with more than 4 people could be a problem especially if it is with people who love to talk and hear their voice. A good argument between a few people will be hard for me to jump in on. Try been more attentive. Remember I'm there, and cannot raise my voice over others if I want to jump in and add something to the conversation. 2. It's hard to swallow. This got much worse after that surgery in the summer of 2007. I had a swallowing test. They make you swallow a few types of liquid and solid food, and they use an x-ray machine to see how well the liquid and food go down the throat. Seeing the results, I was advised to turn my head left and a bit down to help with the swallowing. If we are eating out, or having some BBQ, don't get weird out by this, I'm just trying to swallow. What you should try to remember is that since it is hard for me to swallow it takes me longer to eat. I have to remember to cut my food smaller, and chew longer. So if you're trying to estimate or plan the night, remember that dinner would take a bit longer. Also, sometimes I swallow to quickly. What I usually have to do is cough the food back up so that I can chew it a bit more. It rarely gets to a point where I have to spit my food out. You probably won't notice me coughing up my food unless you are watching me eating the whole time. Try to save face, and don't get gross by this. If we order a shared dish, probably an appetizer, try not to be too rude, and leave me my share. What I might feel like doing (perhaps if I had some bad experiences with you) is take some of the dish to my plate. Please don't give me attitude, and remember I need to chew longer than you. By the way, everyone should take their time and chew longer. Researches say it is a healthier way of eating. Plus you will enjoy your food more if you take your time and really take in every bite. Water. If there is a jug of water on the table, or some other soft drink, please do not give me attitude if I fill my glass all the way up, and by that finish what was left in the jug without offering some to someone else. Sometimes I feel like I might need the extra water to help me swallow down the food. It's better than me chocking, and making a scene right?! 3. I don't hear well on my left ear. This is nothing new, but I feel like it has gotten worse. Could be that I'm just more aware of it now. The nerve itself is ok, it just that the ear canal is blocked because of the shape of my ear, and the sound doesn't get through well enough to the eardrum. If we are walking on the street, try to walk to my right. 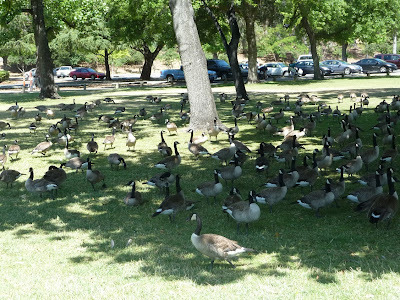 If we are sitting somewhere, anywhere, sit to my right. Don't even think of trying to whisper in my left ear. This hearing problem gets worse when I'm eating. Especially food like potato chips and similar food that cracks and makes lots of noise in your mouth. If you are talking to me, and I'm not responding please don't get offended, I'm not ignoring you, I'm not that kind of a person. Try taping my shoulder or waving your hand right in front of me like an idiot to get my attention (don't worry I won't think you are an idiot, unless you really are...). I also have ADD, so just make sure I'm aware you are talking to me. You could be right next to me, especially if you are on my left, and I won't be responding. Again, I'm not ignoring you, I'm just not hearing you (well the correct term would be listening), and that is due to medical reasons. 4. My left eye doesn't blink. The whole left side of my face is paralyzed. When it comes to my left eye, it won't blink, maybe a little, but not all the way down. As a result, single tears come out sometimes. When your eye blinks it is kind of similar to when you swallow the saliva your body produces. The blinking is like the swallowing. So if you see a tear coming out from my left eye, don't be alarmed, I'm not crying. Unless it was something you said, but probably not. I almost never let what people say to me offended me. Yes, I'm an emotional guy. I could spare some tears if I'm watching an emotional movie, or a sportsman I like cry after winning some tournament like Bubba Watson did when he won the green jacket at the masters this year (what a shot on that 10th hole aye?). But if you see a single tear coming out of my left eye to say hello, don't worry just hand me a tissue. I've moved to a new apartment this week, so it took me longer than I wanted to finish this second part, but here it is. Ok, hmmm, where to begin?! Fruits part 2. 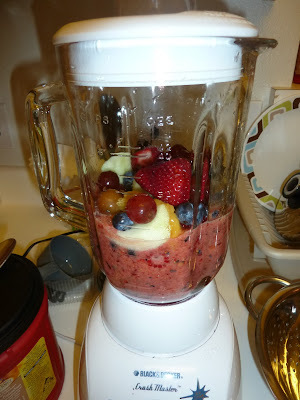 As I said in the part 1, I meant to talk about some of the fruits from back home that I miss. My memory isn't that good, I cannot remember a specific day where I went for a stroll, and picked some of my favorite fruits from some of the trees. Perhaps it is because there were countless such days. Maybe as I write things will come up to me, but this part 2 might be filled with facts about these fruits. Let's begin with the fruit that I believe most of you will recognize, and that is the GUAVA. Now I bet most of you have heard about pink/red guava juice. When I say guava, I'm talking about the white guava fruit. 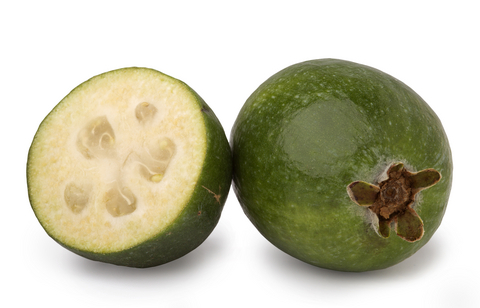 Guava originated in Mexico, Central America, and the northern part of South America. Nowadays you can find it everywhere. It has a pear like shape. 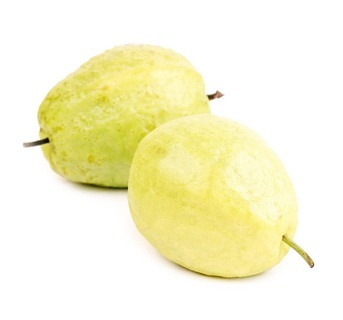 Like many fruits guava is green when immature, and turns yellow when ripe (why would they call it white guava then?!). I like to pick off the guavas just before they turn completely yellow. Once the guava is yellow you have about a day maybe two to eat it. After that the guava becomes too mushy, and probably already went bad. The size of the guava varies greatly between trees, and even on the same tree it could vary pretty good. Some trees can give fruits of 5 inches long (12.7 cm), but I think the average guava is more like 3 inches (7.6 cm). just on the verge of been too yellow for me. eat a guava this way, I just bite into it. Huh, I'm a little embarrassed to say I cannot remember the guava's unique taste, or maybe just don't know how to describe it. I remember that sometimes the taste would stay with me for a few hours. I also remember that I ate a lot of guavas. There was a nice sized white guava tree close to my house. It was at about 15 feet tall (4.6 meters). It also spread out nicely to the sides making a nice round shape. This tree was strong, healthy, and would give lots of fruits. This guava tree had lots of branches, and was very climbable. I remember climbing pretty high up there on this tree. Maybe 10 feet high. I believe I was about the age of 11-12 years old at the time. Back home in the kibbutz, we have lots of trees with all types of fruits. 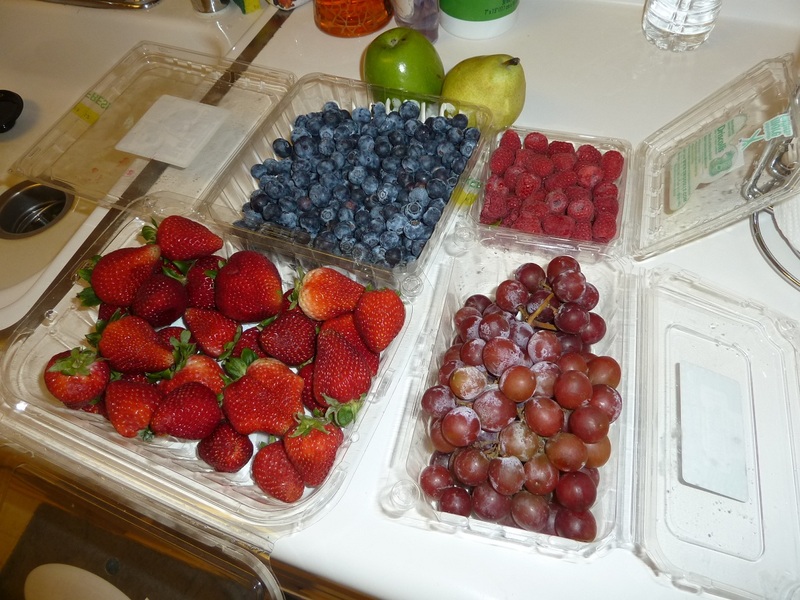 I've been here in the US for almost 10 years now, and there are some fruits I really miss. 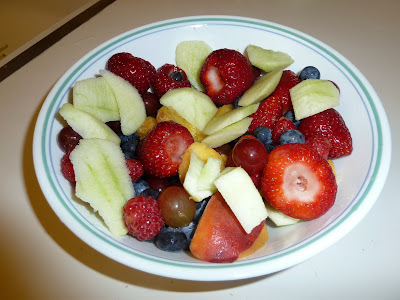 Fruits that I cannot find here in the supermarkets though I haven't yet tried farmers markets. 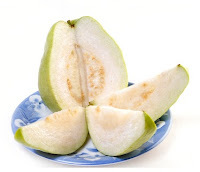 I think I've seen an actual guava fruit in supermarkets near me, but they looked different from what I know. What I haven't seen is, I present to you, the one and only, the PIIIIIIIITAAAAAAAANGAAAAA! Or just PITANGA. Pitanga is also know as Surinam Cherry. I don't think I've ever seen Pitanga in supermarkets. I don't think anyone of my friends here have ever tried it, or even heard of it. I also don't recall seeing Pitanga in supermarkets back home. Maybe it isn't well known in Israel either? And I just know it because we had a few trees in the kibbutz? Pitanga is a small less than an inch long, and has a roundish shape. When fully ripe it has a purple color, but I like it more just before it turns purple, and has a red color. When the Pitanga is red, it has a sour taste with a hint of sweetness. 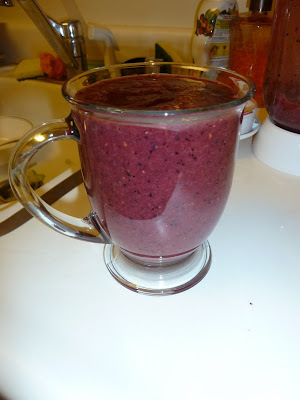 When it is purplish it is the other way around, sweet and a bit sour. There used to be a nice tree right outside the electrician shop back home (last I saw it didn't look too well). Pitanga isn't a big tree. I think it varies between a bush and a small tree. This one tree had lots of branches, and I think was about 8-9 feet tall (I'm guessing). It wasn't climbable like the Guava tree I was telling you about, but there was still a nice place on the tree to put your foot in to get up about 2-3 feet. I ate many Pitangas at that tree. I would also scan the tree to see which ones will be ripe in a day or two. The Pitanga, by the way, originated in South America. I would love to have some PITANGA in my hand right now. big seeds for such a small fruit. a third of the entire Pitanga. The next fruit is the BLACK MULBERRY. Black Mulberry looks like black berry, but it is a bit longer (about 1/4 inch), and not as wide. The only tree I remember of Black Mulberry from back home was at one of my ima's best friends' house. It is hard to tell from here, and I wasn't there for a long time, but I think that tree is about 15 feet high (they go up to 30 feet which is about 9 meters). It has a nice round shape enough to park a car under it which gives a nice shade. I can't remember if I liked the black mulberry when fully ripe or just before. 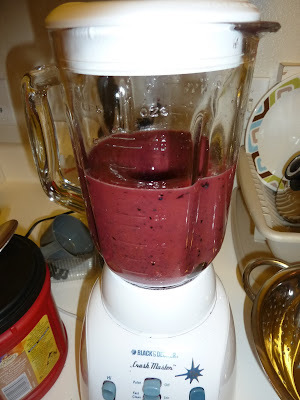 I think I used to like it just before, and then one day I started liking it more when fully ripe, when it's color... yup was black or maybe dark purple. I have a vague memory of eating white mulberry, but I'm not sure where. And indeed there are a few species of mulberry. Hey! This fruits is not native to South America. 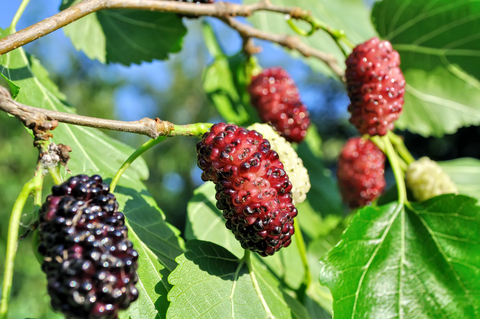 The BLACK MULBERRY is native to East China. Let's finish this post already. The last fruit is the LOQUAT. It's another fruit originated in China. This one in Southeastern. 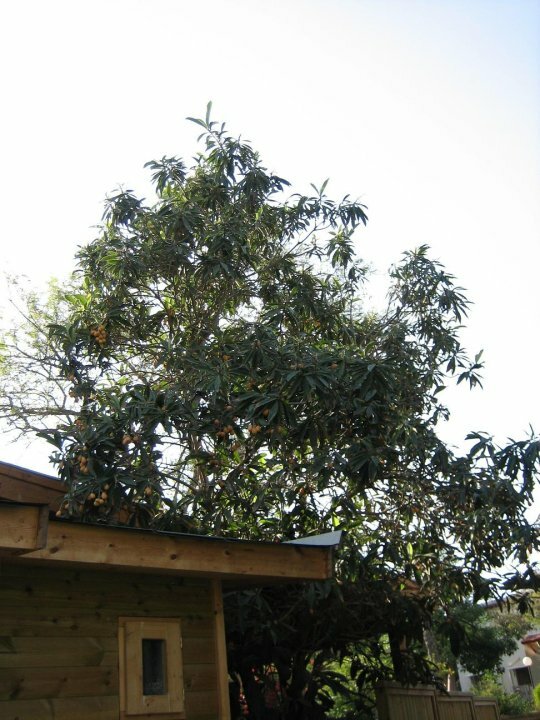 I actually see a lot of Loquat trees where I live, but I don't think people know you can eat it. I love loquat, and I was lucky on my last visit to Israel to be there in season. I have a tree back home that I planted about 15 years ago. I ate some loquat off my neighbors' tree, and I took the seeds from the ones that tasted good. Then I planted them in my ima's garden. I'm not sure if it made much of a difference, but the fruits this tree gives are very good. This tree is very tall I think about 15 feet (yeah I guess they all look the same height to me), and it is a shame because you cannot get to so many of its' fruits. I get about half way up with a ladder. On this last trip I probably ate over 100 loquat. 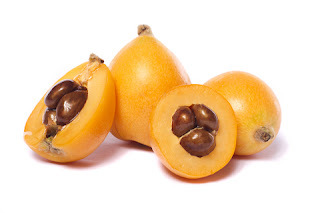 The taste of the loquat is sweet. It is green when unripe, and turns orange when ripe. I sometimes will pick off the loquat when yellow. It is a bit sour then, but I prefer it when fully ripe. When it is fully ripe it has an orange color, and tastes sweet. The size can get up to about 2 inches long and about an inch inch and half wide. Here are some pictures of the LOQUAT. This is the tree I planted 15 years ago. So that's about it from the fruits I grew up on. A short reminder, if you are in the San Jose next weekend my NF family and I would love to see you at the 2nd annual San Jose NF walk. You can register here. If you cannot make it, it is ok, maybe you can help me with my fundraiser. 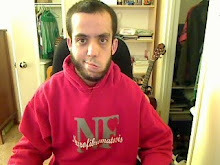 The money will go towards research to find a cure for NF. Click here to go to my fundraiser page. THANK YOU!! 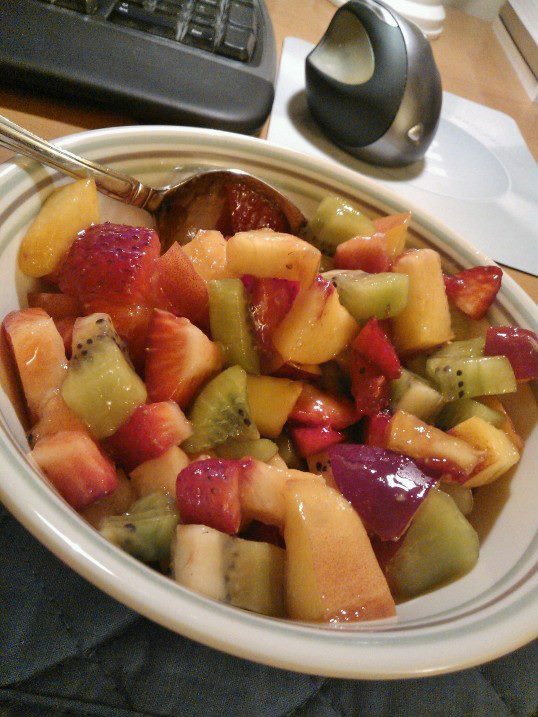 I love fruits. What are some of those fruits? Yellow peach. They have this amazing sweet sourish taste. What's a little annoying with peaches is that you never know if they'll be good. Often, at least in my area, I get bad peaches. When I go to the store I buy 1-2 peaches that feel ready to eat, and a few more that need a few days to soften. Sometimes they taste great, sweet sourish taste, just perfect. Sometimes it is easy to cut them in half, and take out the seed. Other times the seed breaks in half, or won't come out. 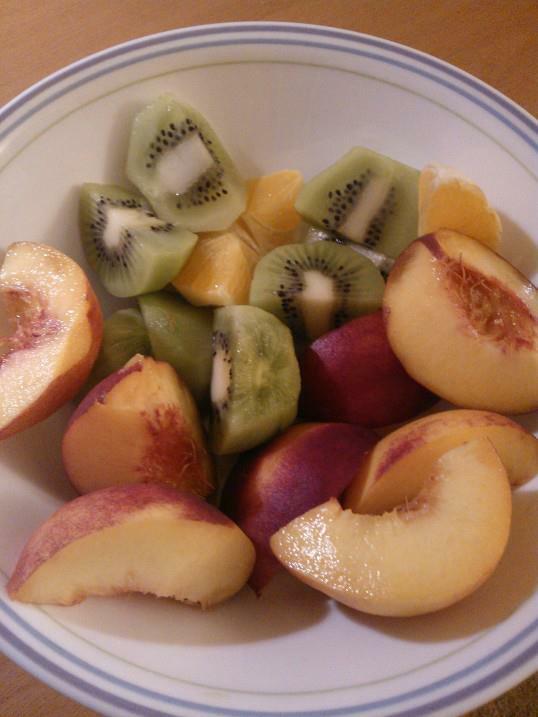 I do like white peaches as well, but much rather have yellow ones. The white ones don't have that sourish taste. I like red grapes. They have to be seedless. The seeds are bitter, and ruin the sweetness of the grapes. The ones I buy also have a little touch of sourish taste to them. Growing up I used to only like green grapes. I think the green grapes back home are very different from the ones here. Or maybe my taste changed a little, that's definitely a possibility. I also really like a sister to these two fruits - nectarine. Clementine. I love clementines. Of course they must be seedless. Having seeds ruins it for me. Instead of focusing on each slice's taste, I have to focus on catching the seeds, and spitting them out. With clementines like peaches you also never know. Often I get clementines that are dry, and/or tasteless. 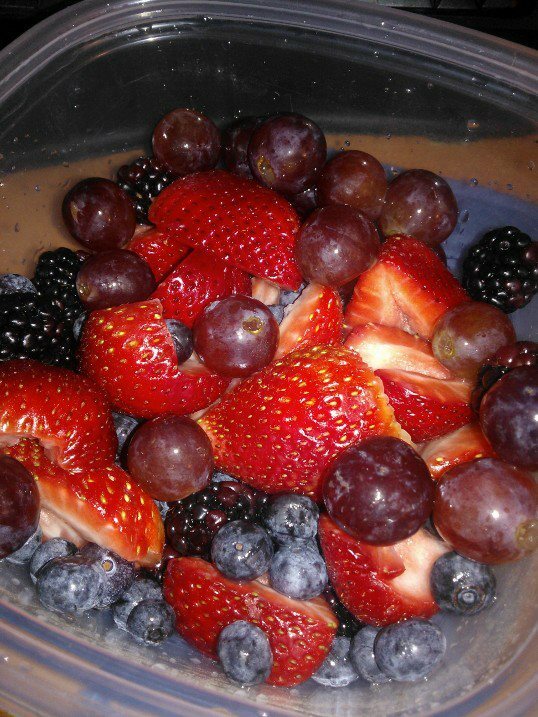 Berries. Straw - cannot get enough of them. If you didn't know, they grow on the ground, so don't be lazy, wash them extra well, and extra long. Blue - I just recently started eating them. I think the main reason I started eating them is because of how everyone are saying how good they are the body, and all of the healthy benefits it gives. Rasp - I used to eat them a lot. Very recently I kind of got tried of them. 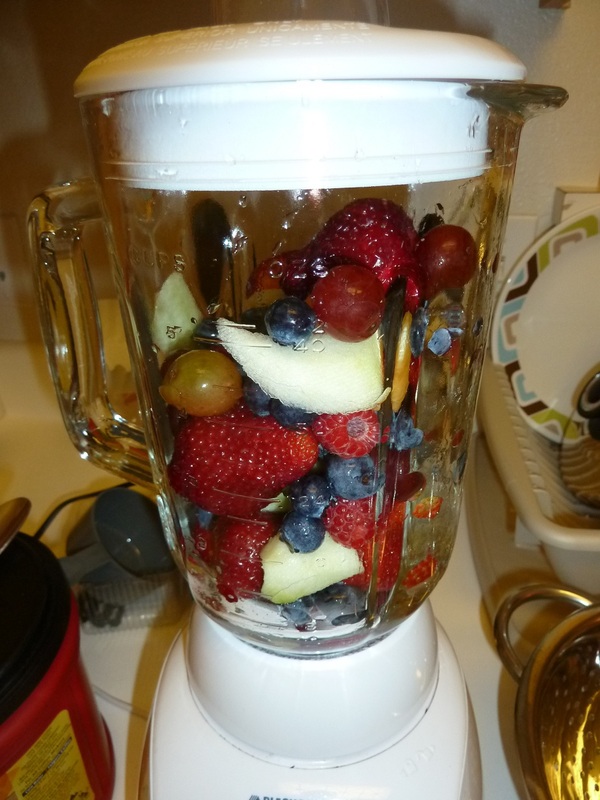 I'm, however, putting them in fruit shakes which I drink a lot of these days. Watermelon, both green and orange melons (if they are actually ready - meaning they are soft all the way out), kiwi, pear, and you know what I'm gonna say corn. But only a corn on a cob boiled a few minutes in water. It is debatable whether corn is a vegetable, fruits, or a grain. I think it is all 3. Corn from a can is a vegetable, corn on a cob would be a fruit, and you have the those dry corn seeds which you can use for popcorn. There is one fruits, that most people, if not everyone but me seem to like, and that is mango. I don't know what is it. Everyone seems to love mango, it is probably a favorite of many. But I don't like mango. I think it might be something in the texture of the mango. And I think there is some bitterness in the mango that throws me off. I don't know, I just don't get the taste of mango. Recently I've been eating lots and lots of corn. The white corn, not the yellow. The white usually comes out sweet, and not as thick as the yellow one. As a kid I loved corn. The closet city to the kibbutz was about 15 minutes from my house. There was a guy there with a corn stand. He always had this patch (no, not black like a pirate) on his eye. I think it was the left. All he had was this small cart maybe 4 feet long. And at times he would get busy. The line would be of maybe 10 people I think. He has in business for years. For years he was there, at the same corner, selling hot fresh corn. I cannot remember exactly what corner it was, but I think if I'll take a walk in that street I will be able to tell. I think at some stage in life I stopped eating corn on a cob. I didn't like it when pieces of corn would get stuck in my teeth. But I like the white corn enough to just eat it without worrying about those little annoying pieces. I just take a toothpick afterwards, and pick out those corn pieces. Ohhh wow, I meant to talk about some exotic fruits that I would eat a lot of as a child back home. Exotic fruits that I cannot find here, and miss very much. I wanted to start just by saying some of the fruits I like that I can find here, and somehow I got carried a way, and said a lot more. Instead of continuing about these awesome exotic fruits, I'm going to break this post into two pieces. I need to find pictures of these exotic fruits that I can put in my blog, and I don't want to use pictures without permission. These next three pictures are mine though. Mmmmmm, I wish I had some from the third picture right now.